No Air Ducts? No Sweat! When summer’s hot temperatures arrive, you have two options: Sink or swim. If you choose the latter, then air conditioning your home is a “nest”cessity. With Swanton Energy Services, a ductless home isn’t a problem. It’s an advantage. That’s because migrating to our ductless mini-split air conditioner will take you to new heights. Not only will this unit help you attain a cooler space, but its ductless nature will give you complete control over your comfort, too. Simply put, a ductless mini-split will keep your chilled relief afloat even on the hottest day of the year. It’s a smoother flight to a cooler home when you choose a ductless mini-split as your co-pilot. Here’s why. A mini-split ensures you’re the captain of your home comfort. Rather than cooling your entire home, this unit’s ductless nature gives you the power to provide chilled relief exactly where you need it and only where you need it. Through this direct cooling method, a ductless mini-split operates more efficiently, delivering a cooling loss of less than 5 percent. This keeps those pesky, high energy bills grounded so your savings can soar. Unlike a traditional HVAC system, a mini-split air conditioner doesn’t have air ducts for harmful airborne particles, dust and allergens to cling to. This means, with a ductless unit, your indoor air quality won’t hit turbulence. Flying ductless reduces your high energy bills and eliminates harmful pollutants in your home, all while nurturing a cool and comfortable environment that you can’t help but nestle up to. However, if your system isn’t installed properly, expect its performance to take a nosedive. This is a flight risk for both your peace of mind and your budget. At Swanton, our professionals want what’s best for your nest. So, with us as your wingmen, you can guarantee everything will fly smoothly. From flawlessly installing the perfect ductless system for your home to quickly swooping in to fix any issues your unit encounters, we’ll keep your system’s performance on course throughout your entire chilled relief journey. Float your way through summer with the system that makes beating the heat a breeze. Fill out our online form or call us at 732-335-6731 today! 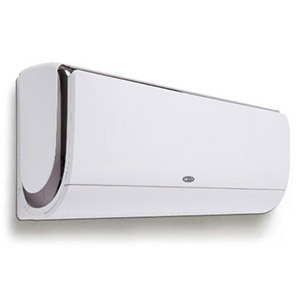 Whether you need a cooling system for a ductless home or you just need to cool a small space that you don’t use often, a mini-split air conditioner from Carrier will do the trick. These high-efficiency units boost your comfort and your savings. Now that’s a win-win!